288 pages | 86 B/W Illus. This book presents a fresh approach to poverty alleviation by bridging the fields of international development and social entrepreneurship. The authors present a six-step model for developing an IP business positioning strategy that allows developing country producers to position themselves better as owners of retail brands in foreign market countries. Readers will learn how producers can control the supply　chain, including distribution to retail stores. Focusing on Africa and least developed countries (LDCs), the authors demonstrate methods of utilizing intellectual property tools, producer ownership, market positioning, and branding for lucrative outcomes. Extensive research provides readers with a thorough understanding of what it means to work smarter in a developing business, while a rich set of international cases offers insight into the practical applications of brand positioning, trademarks, and licenses. 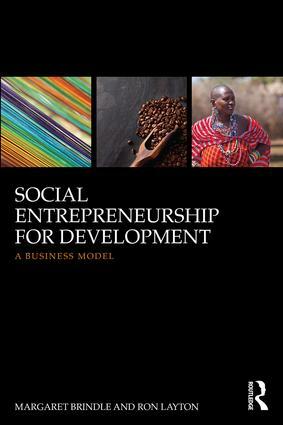 With a dozen online workbooks to outline methodology, skills, tools, and case studies, Social Entrepreneurship for Development will be a valuable resource for any student of social entrepreneurship or international development. "A concise, well written book that addresses the gap that has arisen between developed and developing countries in benefiting from branding and IP ownership. It is both timely and much needed. The real-life examples of how IP positioning can be successfully applied will greatly facilitate widespread adoption by social entrepreneurs and provide a really practical tool kit to improve outcomes for social entrepreneurship programmes." "This insightful and timely book provides a practical guide to both policymakers and entrepreneurs with an African focus on how African producers can better capture the value their labor creates. The authors present a convincing argument, using examples and language readily understandable to the lay reader. Their book reflects a lifetime of work, delivering quantifiable improvements to the livelihoods of diverse groups of people in Africa. It deserves the widest possible readership." The Power of the Historical Record: Intellectual Property Business is Not New! Margaret Brindle is director of education at Light Years IP in Washington DC, USA. She has held tenured professor roles at George Mason University and Carnegie Mellon University. Ron Layton is founder and CEO of Light Years IP. He has 40 years’ experience working in intellectual property and international development.